I thought I would give a quick update on my home server for my fellow Linux geeks. 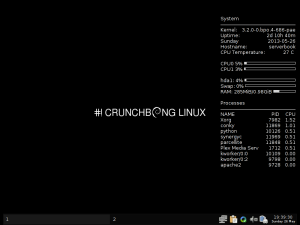 I currently have it running Crunchbang Linux. If you are unfamiliar with Crunchbang it is a low resource Linux Distribution based on Debian. I chose Crunchbang because of how much I like Openbox as a low resource window manager and Cruchbang comes with Openbox configured nicely. It’s much quicker to use Crunchbang as a base as opposed to trying to configure Debian to pretty much the same way. One of the primary purposes that I use the server for is to act as a home webserver for my wife’s blog SarahDarr.org and my blog here at PaulDarr.org. The software I use to support the blog is Apache webserver, MySQL database and WordPress. Another use I have for my home server is to act as a media and file server. For media I run Plex, which allows me to stream my music, home movies and DVD copies to my Roku boxes and Android Smartphone. I already had several Roku boxes and Plex is currently one of the best ways to stream media to them. As a file server I just connect using SFTP and do manual backups of my data. Yet another duty for my home server is to act as a print server. That’s taken care of using CUPS and the Chromium web browser. The use of CUPS is a no brainer but some of you might be wondering why I’m using a web browser. Both Chrome and Chromium support Google Cloud Print. Google Cloud Print enables my wife to print from her Chromebook and me from my Android devices. I don’t run Chromium all the time but it does have a service running for cloud print. On the hardware end of things my home server is running on an Acer Aspire One D255 Netbook. I upgraded my laptop in 2011 and I had this sitting around as a spare. The D255 has a 1.6 GHz Atom processor, 1 GB RAM and 160 GB hard drive. I have an external 320 GB hard drive connected for additional storage. 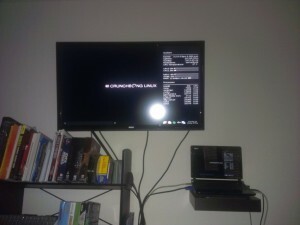 I have the laptop connected to the 32inch TV in the room for extra eye candy and the laptop is suspended on a shelf. As a father of a soon to be 2 year old son it’s good to keep the server out of his reach. To connect with a keyboard and mouse I use Synergy to use my desktops mouse and keyboard with the Netbook. So far the Netbook does a surprisingly good job as a multi-role home server. Even with all the extra programs I have running it uses less that 300 MB of RAM while in it’s regular use. Overall I would say I am pretty happy with my hardware and software setup. The only addition I have planned is to automatically sync the backups from my desktop. This is an awesome post, thank you. I’ve just been considering using Crunchbang for a home server, since it seems to have all the main tools I’ll need, so it’s really good to see an article from someone who’s already done this – I’ll be bookmarking this page for future reference. I’m still using Crunchbang as the base. It works well if you want something more than a CLI but really lightweight. I even added yet another role to it today as a wifi access point. Thanks for sharing. Stumbled upon this when searching for a lightweight Linux distro to run Plex on, found #! Then searched for that and Plex and found you. I just installed Ubuntu 10.0.4 on my old eeePC (900Mhz, 2GB RAM). I didn’t expect much. It works ok-ish but obviously a lighter distro would be good. I gift give it a go after reading your post. Cheers! I like Ubuntu on my desktop but I think you are right and that Crunchbang will run much better on that hardware. Like Tim, I stumbled upon this while looking for a lighter-weight distro to use for Plex. I’m using an old HP desktop I had lying around, which while very capable with Ubuntu 12.04, still slows a little bit when Plex and the other apps are doing intensive tasks. How much trouble did you have with getting Plex running on !#? I tried getting Plex to work on Debian, but couldn’t get it to work, even with the repo some users made. Garett, Plex works fine for me on Crunchbang but I used the same Debian repos you had trouble with so YMMV.